The Cut N Go Seat Belt Cutter is the best tool of its kind and these 4 features make it totally unique and ONE-OF-A-KIND! Installation of the Cut N Go is truly simple. Teenagers, Seniors, Ladies and even guys who are not handy, can install the it. This is NOT one of those tools that you have to take a class to be able to install. Just remove the insert and then slide the Cut N Go over your seat belt with the opening facing the dashboard. Then close it. Slide it down to just above the buckle. That’s THE SWEET SPOT. Once the device is closed, it’s LOCKED ON. That means for life! If you sell the car or trade it in, the Cut N Go goes with it. The only way to remove it is to use it. We paired these 2 features together because one makes the other possible. The Cut N Go is a fully self enclosed device. The design makes it completely childproof. The blade inside will never be seen by you or your young children, EVER. You won’t see it when you buy it, during installation or during or after use. 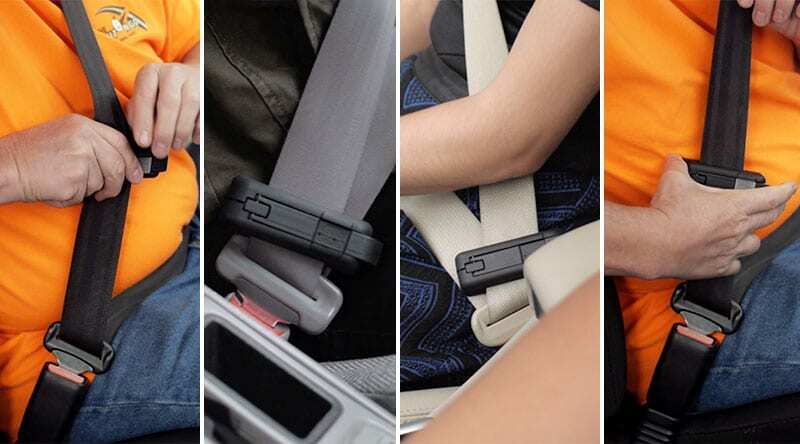 It is completely enclosed in super tough nylon which allows you to cut the seat belt but not cut yourself. The window breaking pin is hidden, as well, making it even more childproof. Blade and breaking pin – Out of Sight Out of Mind! The Cut N Go has smooth rounded edges which cannot scratch or otherwise harm your kids or your clothes. It is safe around your Sunday Best or even your Wedding Dress. Cut N Go is THE ONLY device of its kind that allows you to cut the belt without allowing that belt to curl. Curling of the belt during use is a Major Issue with similar products. Cut N Go holds the belt flat and cuts it that way. It’s just what it sounds like. YOU are the one installing Cut N Go, placing it and using it, if the need arises. YOU are totally in control of this device. It is YOUR hands that put it to use. Technically, you only need ONE HAND to use Cut N Go. Because most similar devices on the market are, for all intents and purposes, right-handed, the Cut N Go is the most usable tool for EVERYONE. Your finger or hand size does not matter. Your age is not an issue, either. We had a 7-year-old test it with no problem. You only have to put the Cut N Go in place and the guided blade ensures that it will do all the work. There are no batteries or other power sources needed to use it. It’s Just You! The Cut N Go truly is One-of-a-Kind! You can be one of the FIRST to purchase the Cut N Go. Sign up NOW for reminders regarding our Product Launch, December 4, 2018.